Google spent years studying what makes effective managers and found ten key behaviors. One of those key behaviors is “strong decision maker”. Click here to read about Google’s study. When was the last time you or your team sat down and evaluated the lessons learned from either a great decision or a bad decision? Managers, employees, and teams are constantly making and implementing decisions, but few examine the process and assess the quality of their decisions. In today’s business environment, the impact of a poorly made decision can be costly. On the other hand, a great decision can produce results that will move an organization forward. 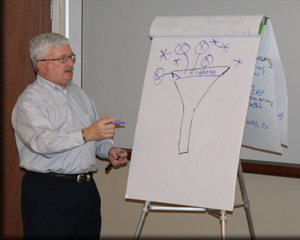 This one-day seminar gives participants the process and tools for making effective decisions. This seminar utilizes group exercises, movie clips, real-world examples and a team case study to help participants analyze and improve their decision-making skills.